Knowing when and how to induce vomiting can save your cat’s life in a dire situation. There are lots of foods and plants that could be harmful to your feline friend. We all know how curious our kitties can be, so be sure to keep these substances out of their reach and you can avoid having to induce vomiting altogether. Even the most diligent of pet owners however, can have a sneaky cat who gets into something they shouldn’t plus accidents happen and it’s always better to know what to do in advance. During an actual crisis isn’t the time to be googling how and when to induce vomiting in your pet. If your cat has already vomited. Inducing more vomiting could damage your cat. If your cat is already vomiting, let nature take its course. If your cat is seizing, convulsing, appears very weak, has lost consciousness. This cat is too sick to induce vomiting and should be taken to a veterinarian immediately. If your cat has ingested bleach, drain cleaners, acid, cleaning products or swallowed a sharp object. Some products can seriously harm your cat coming back up. This is why telling your vet exactly what your cat ate is critical. If you’re unsure, get to the vet ASAP for x-rays and testing. If it has been over two hours since your cat has ingested something. By this time, the substance is already in your cat’s system and will only lead to further aggravation. Get to your vet ASAP. You always want to contact your veterinarian before any attempt to induce vomiting, inducing vomiting is dangerous. Also the ASPCA Poison Control is your greatest resource if you think your cat has eaten anything toxic. You need to be sure that this is the right thing to do to save your cat’s life. 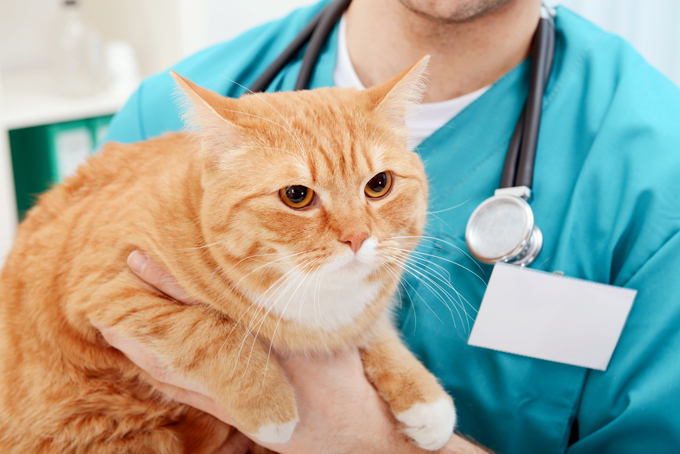 Tell your vet specifically what your cat ingested. If your veterinarian gives you the OK, here is how to proceed. If your vet recommends the hydrogen peroxide method to induce vomiting here’s some helpful guidelines. Your vet will tell you the proper amount to use based on your cat’s age and weight. Be sure that you are using a 3% solution. Do NOT use hair coloring strength peroxide. Note: It may seem like a good idea to induce with syrup of ipecac or salt water, but those can be very harmful to your cat, especially the former. Only induce with those or other substances if it is specifically recommended by your vet. Veterinarians will generally recommend one teaspoon for every five pounds of your cat’s weight, but again, check with your veterinarian. The best route of getting your cat to take the hydrogen peroxide is to use an oral syringe. If you do not have an oral syringe lying around, try using a clean eyedropper, a spray bottle, or just pouring it down their throat. It’s probably going to be a struggle so you may want to wrap your cat in a towel to keep them from moving around or injuring you. Once your cat has taken the hydrogen peroxide, allow your cat to walk around. It will usually take 15-20 minutes for vomiting to occur. Once your cat vomits, they could very easily try to re-ingest the substance, so keep a careful eye on your cat during this time and clean up the vomit right away. If your cat does not vomit within 15 – 20 minutes talk to your vet to see if the procedure needs to be repeated. If the first two rounds of hydrogen peroxide don’t work DO NOT administer a third round. Get to the vet ASAP. After the cat has vomited and you’ve cleaned up the mess, it’s recommended that you take your cat to the veterinarian for a full evaluation. Do not make assumptions that your cat is okay now just because he or she has vomited up the toxic substance or object. Hopefully, inducing vomiting in your cat is something you never have to experience. Just to reiterate, if you did see your cat ingest something potentially toxic, ALWAYS contact your vet or an emergency veterinarian before you take drastic measures.